A few months ago I was doing some reading for class about the Industrial Revolution and I saw a book on the reading list that I’d heard of before but couldn’t remember why. I took it down and read a few chapters and my mind totally blown by its description of the rise of capitalist social relations and the accompanying social dislocation in Europe. The book is called The Great Transformation and it was written during World War II by Karl Polanyi, a Jewish Hungarian émigré. The second half of The Great Transformation focuses on Polanyi’s prescriptions for dealing with the disembedding, which is to create a kind of socialist society that provides basic protections for people. Indeed, many argue, most famously the political economist John Ruggie, that this is precisely what happened in the capitalist world after the end of WWII with the rise of welfare state policies, in particular in Europe but also to an extent in the United States. Ruggie calls that the era of “embedded liberalism.” After the 1980s, with the expansion of capitalist globalization and the growth of international financial markets, there was again a kind of “disembedding,” which has gotten us to where we are now. I’ve thought about Polanyi’s analysis a lot since then. Reading a recent blog post by, of all people, Andrew Sullivan brought Polanyi up again. Capitalism is in this sense anti-conservative. It is a disruptive, culturally revolutionary force through human society. It has changed the world in three centuries more than at any time in the two hundred millennia that humans have lived on the earth. This must leave – and has surely left – victims behind. Which is why the welfare state emerged. The sheer cruelty of the market, the way it dispenses brutally with inefficiency (i.e. human beings and their jobs), the manner in which it encourages constant travel and communication: these, as Bell noted, are not ways to strengthen existing social norms, buttress the family, allow the civil society to do what it once did: take care of people within smaller familial units according to generational justice and respect. That kind of social order – the ultimate conservative utopia – is inimical to the capitalist enterprise. One reason, I think, that Obama’s move toward a slightly more effective welfare state has not met strong resistance – and is clearly winning the American argument – is that the sheer force of this global capitalism is coming to bear down on America more fiercely than ever before. People know this and they look for some kind of security. In other words, it is precisely capitalism’s post-1980s triumph that has helped create the social dependency so many conservatives bemoan today. To achieve that level of influence before he leaves the White House will require not only that he enact an ambitious legislative agenda in the next year or two but also that he provide — and sell to voters beyond his base — a compelling alternative to the conservative mantra that nearly all problems can be traced back to excess government. As the Times rightly notes, this will require a major ideational shift in America. But there’s reason to believe it might be happening. For background on the whole situation, you can read our own editorial on the whole fracas here or an article by the author of the censored article here. The original article is here. You can read a parody of the editorial below here. I’ll add my own thoughts at some point, but wanted to make sure that the English translation was available in all its glory. Also, I want to add that this is far and away not at all the most important thing in Egypt right now or even of interest to many people. I thank God for his several blessings, one of which is that I am thick-skinned: I only contemplate objective criticism. Another of God’s blessings on me is that I do not fear but my Creator, for no harm can befall me unless God has written it. Yet another of the blessings God has bestowed on me is that, like you all, I was born of Egyptian land and have learned to cherish my Egyptian nationality and to act in the belief that my country is a major power. The fact that we have survived decades of degeneration should not make us think of ourselves as standing in an inferior position with regards to the West. Half a century of events will eventually be written in three lines in history books and Egypt will rise, because we will not abandon it, no matter what crises we face. Neither American writer Robert Springborg, nor British Independent’s correspondent Alistair Beach are able to grasp this culture, belief or that kind of loyalty to a nation that has taught its people to die for its defense. Both of them, as well as others who live among us but are bedazzled by the lights of the West, are not aware that a genuine Egyptian cannot be blackmailed, pressured or threatened. They heaped pressure on Al-Masry al-Youm to publish an article for Springborg in the pilot English supplement inciting Egyptian army officers and Sami Anan, the chief of Staff of the Armed Forces, to mount a coup and seize power, particularly following the results of the first phase of elections, claiming Field Marshal Tantawi is allied to the Islamic wave. Believing the English supplement staff were well-intentioned, I assumed they lacked sufficient experience or did not recognize who the American writer was. But because I know who he is quite well, I stopped at the article, read it over and over and decided not to run it. I did not take into account the writer, the country he belongs to, or to its bloody practices across the world. Nor did I fear his ensuing bellowing in the Independent or Foreign Policy. I could not care less for the broken record about freedom of speech, employed by the West to achieve its nefarious ends against us, when it suppresses those freedoms to protect its interests and national security. Springborg and those backing him are unfortunately faced with a man who cannot be blackmailed, who is not West-struck or ultra-impressed by Western press. I think of myself as equal to them, even superior, most of the time. For those who do not know, Springborg is the Program Manager for the Middle East for the Center for Civil-Military Relations, a government center affiliated to the US naval forces and a branch of the Pentagon. So, do you now know who the writer is and who is inciting Egyptian officers and the Chief of Staff to launch a coup? He believes that the attack he and some people in Egypt are launching against me will push me to change mind on a choice I have made based on national interest. But for me, one black strand of hair from an Egyptian child in the heart of Upper Egypt is of greater value than his country or the entire West. He works for the US Pentagon, whereas I work for the simple Egyptian citizen. He derives his arrogant power from the American arsenal, while I find protection in satisfying a poor man in some impoverished Egyptian neighborhood. He and those allied to him are using the internet to arouse people against, while I seek refuge in the soil of may land which they want to occupy through creating chaos and inciting military coups, squishing Egypt back to square one. To that Springborg and those behind him I say that we insist on refusing to run his article. Al-Masry Al-Youm’s opinion writers, of whom I am one, criticise the SCAF extensively–but they are free Egyptian citizens who do not work for the US Pentagon. Those in the US and its servant Britain who are not happy with what I have written might as well put that in their pipe and smoke it! I walked around Tahrir and the surrounding streets for a few hours tonight. I’ve visited a couple of times before in the past few days but haven’t been able to spend much time there, mostly because we’ve been finishing up the first edition of our new weekly print newspaper. I hadn’t really gone close to the front lines of the fighting, but that’s been okay with me. War reporting isn’t the kind of journalism that interests me. But after seeing the square again and getting close to Mohamed Mahmoud Street, which has been the epicenter of the running battle between Ministry of Interior paramilitary forces and the protesters, I’m left feeling a little haunted. Being there overwhelms the senses. The acrid stench of teargas hovers over everything, mixing with the smoke from bonfires made of garbage and the smoke from the sweet potato vendors who burn treated wood to heat their ovens and the piss that the fighters (understandably) discharge against the walls. The endless stream of ambulances assaults your ears, as do the incessant honking of the informal motorcycle ambulances that go all the way up to the battlefront, and the chants of “Down with the field marshal!” and, closer to Mohamed Mahmoud, the bang…crash/whistle of teargas cartridges. Inside the square, you are jostled by the crowds of people, pushed aside to make room for fighters on their way back to the front line or wounded on their way to the hospitals. The eyes take in everything under the tungsten street lamps: The crying faces of teargas victims and the alien-like visages of men and women in gas mask wearers, the swirling blue ambulance lights. Perhaps this kind of scene is pedestrian for people who are in conflict zones regularly. For me, they are new. Some people say that the square right now reminds them of the 18 days in January and February. I have to disagree. When I was here in February the feeling in the square was angry and determined, but it was also somehow celebratory. The energy seemed clearly directed at Mubarak and his regime and was fairly well articulated. 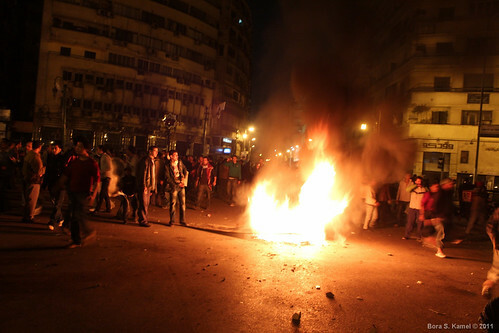 Tahrir does not feel celebratory right now. The constant presence of injured and the number of field hospitals (I counted about five, but that could be wrong) keep the atmosphere from getting too carnival-like. And while there are definitely some families around, the crowd is overwhelmingly young men. I was in the square with some female colleagues and people repeatedly warned them to leave. During the January 25 uprising, the mood was angry, but this seems like a darker, nastier anger. I don’t want to say too much about the politics of all this, but we’ve been talking a lot in the office recently about this question of “state failure” and what that could mean for Egypt. I won’t get into it in too much detail, but I generally believe that real state failure is unlikely here because most Egyptians (or maybe I should just say Cairenes, since that’s what I know best) seem to have a pretty strong sense of nationalism and commitment to the state. But when I looked around the side streets near Tahrir tonight – at the post-apocalyptic scene of toxic fumes and burning garbage and decimated sidewalks – I caught a glimpse of what I imagine state failure to look like. If the state is failing, the blame rests on the military junta’s shoulders. The violence downtown wouldn’t exist if not for their complete refusal to meet the revolution’s demands and their complete and utter mismanagement of the transition. And as the generals have positioned themselves as the guarantors against chaos and collapse, every new instance of street violence justifies their presence. For now, I’ll stay away from conspiracy theories. I don’t know how this will end. I believe that if the generals are going to maintain the social contract, they have to give way to the protesters demands. 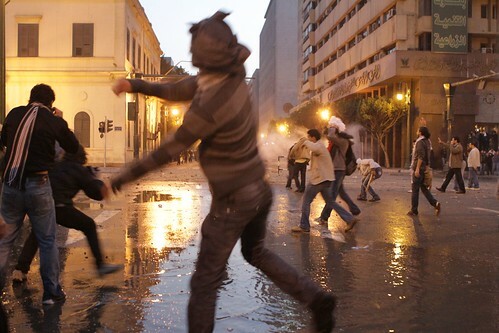 It’s not just Cairo where these clashes are occurring. In Alexandria and Upper Egypt and the Suez Canal cities, revolutionaries are sucking up the teargas. It has to end soon before too much of the country looks like Mohamed Mahmoud Street. Photo courtesy of Bora S. Kamel via Creative Commons. With the Qadhafi regime dissolving in Tripoli and the revolutionary forces ready to take over the country, I keep thinking about a conversation I had in Istanbul six months ago that I think exemplifies the problem of Middle East “experts” these days. I was just back from the uprising in Cairo and high on revolutionary fervor, but I was planning on staying in Turkey indefinitely and needed a way to make money besides flailing around trying to do freelance journalism about a country I don’t know very well at a time when everyone’s attention was focused elsewhere. I swallowed my pride and applied for a position as a “researcher” at a company that writes reports on countries in the Global South to help capitalists in the Global North decide where to invest. (There are, for some reason, a number of firms that do this kind of research in Istanbul and I won’t name which I applied to.) With my experience in Egypt, I was going to work on their North Africa desk. I went in for an interview with the head of their Africa division. I told him my thoughts on Egypt and Tunisia (whatever my thoughts were at that point…) and then the conversation turned to Libya. I believe that this was on February 19, two days after the protests started in Benghazi. Protests were also heating up in Bahrain and Yemen. I told this person interviewing me that I didn’t know much about Libya, but I questioned the Qadhafi regime’s stability and I thought that the revolutions were spread. Six months later, crazy Qadhafi is almost gone, added to the (I hope growing) list of Arab dictators whose time has finally come in 2011. Many people in the business of making predictions, the “experts” on whom so many businesspeople and journalists and politicians rely, are, or at least should be, kicking themselves for their inability to see the fundamental instability of the Arab dictatorship model. I hope that the same guy is now telling people how safe their money is in Syria. I have a new piece up on GOOD magazine about what Americans can learn about democracy from Egypt, namely that protests are a useful tool to push for change. You can read it here. I initially wrote this a while ago, while the both the Tahrir sit-in and the US debate over the debt ceiling were going on. (Also before the London riots, which I think is a tangentially related issue.) The essay was also (very understandably) cut down to a more manageable size for publication, but I’m posting the whole thing here because I think it deals with a lot of other interesting issues about how democracy is practiced in the United States that I couldn’t get to in the GOOD piece. Also, you can do stuff like that when you have a blog. Read it after the jump. I wasn’t in Egypt yesterday because I’m in Turkey, but I have been glued to Twitter, Facebook, my Gmail contacts list, and the media reports, trying to get a grasp on the situation and getting inspired by everything I’ve seen and read. The most exciting aspect of yesterday’s demonstrations is the sheer scale. Accurate crowd estimates are difficult to ascertain, but even the Ministry of the Interior put the number of protesters in Cairo at 10,000, which makes me suspect that the real number is much higher. Some activists suggested that there were over 100,000 people there, which seems a bit dubious. No matter what, though, the number is clearly the biggest in a long while, perhaps since the bread riots of 1977, though maybe comparable to the demonstrations against the invasion of Iraq in 2003. But there are important differences between the 2003 protests and yesterday’s: First, in 2003, Egyptians were demonstrating against an external issue, even if it is one tangentially related to their US-backed dictator. Second, those protests were almost exclusively in Cairo, whereas yesterday demonstrations took place throughout the country. Related to the size and geographic diversity of the protests is that they were a decentralized movement. Much of the organization and mobilization may have taken place on Facebook via the We Are All Khaled Said group (through which 90,000 people said they planned to attend demonstrations), but the turnout seems like it was much more diverse than the usual web-savvy crowd. I’ve been to a number of pro-democracy demonstrations in Cairo and it’s typical to see the same handful of activists at each. Yesterday seemed to attract a different crowd. A friend in Cairo who was in Tahrir Square yesterday, the site of the main protest, put it this way in a Gchat conversation: “you can find cooperation between youth with beard and girls wearing foreign clothes.” Check out the video below from Al Jazeera English at around 2:05, where a older, middle-class-looking woman goes on a rant about the government. She’s not the typical Cairo protestor. I think this is a ripe moment to call for a nation-wide strike so that no one goes to work and more people empty into the streets – but I somehow doubt that will happen. It is much easier for people to go to a mass protest/rally than to miss a day of work – a nation-wide strike really assumes certain privileges that most people (including most of the people that were out yesterday!) do not have. That’s why 6th April and 5th May and all those movements never really got anywhere. Yesterday’s protests were, without a doubt, violent. See this video of the police evacuating Tahrir Square with tear gas and rubber bullets for evidence. But they weren’t nearly as violent as they could have been or, for that matter, as violent as I would have expected. But the Ministry of the Interior has already stated that they will not allow more protests and if the day of anger turns into a week of anger or a month of anger, I think the government will be more heavy handed as they try to prevent a Tunisia situation. I’m afraid the future could hold lot more beatings, arrests and maybe even live fire than we saw yesterday, when three people died. For now we have to wait and see. I’ll be sitting at my perch in Istanbul, aching to be in downtown Cairo as I watch videos of the much-hated Central Security Forces firing tear gas and rubber bullets at crowds that include my friends. Today Egyptians observe the national holiday Police Day. A year ago I was in Cairo and the day was marked by a day off from work and plenty of snide comments. I wrote about it for The Faster Times. This year the day will be marked by a protest organized on Facebook. Some are hoping for a “day of revolution.” I have a busy day in Istanbul, but today my solidarity and best wishes go out to the people of Egypt, a country overripe for revolution.